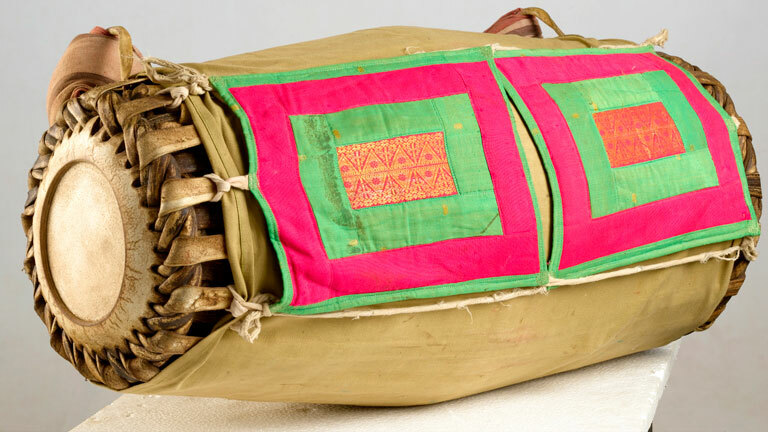 Shudha Madhalam is an anavadha vadya used for artforms like Keli, Panchavadyam, Kathakali and Krishnanattam. Madhalam resembles a Mridangam in shape except the projection in the middle portion. The name Madhalam is a corrupt form of mardhalam meaning one which receives pressure. In Sanskrit it is called Mardhalam. Bullock skin is used for making the rounds and buffalo bull skin for the strings. The skin on the heads is fixed with a paste made of boiled broken rice and charcoal. The process is called "choriduka". The instrument is played by suspending it from the player's hip. In ancient times it was played by suspending from the neck and this style was changed by maestro Venkichan Swami in the 1920s. The player strikes the left head with right palm and right head with left palm. The fingers and palm front are used for playing. Cloth caps are used on right hand fingers except the thumb to avoid bruises.